Okay, it might not be the Oscars, but the “Don’t Move, Improve!” awards run by the brilliant New London Architecture are well worth celebrating! What better way to get inspired about the possibilities of extending your home and getting excited about what architect’s can do for you, the homeowner! We take an in-depth look at the winners here, along with lots more photos of the finished projects to give you maximum inspiration for your own projects! Crafted out of the ruins of an old Chapel, this project has been conceived as interplay between narrative and geometry. Hidden from view the house uses light as its key material and the interior spaces are carefully faceted to create an ecclesiastical atmosphere which is still decidedly modern and domestic. The project remains a play on the nature of a family home and on a chapel, maximising the potential of both spatial typologies. Stego is the refurbishment and extension of a 1980s end-of-terrace house in South London. 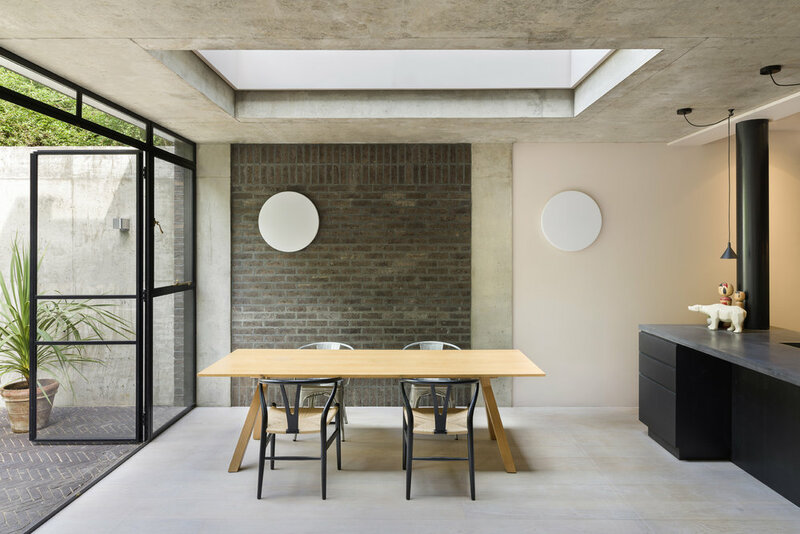 The project connects the main property to a bedroom converted from a garage, via a single storey courtyard extension. Folded Wedge Townhouse is a side extension of a end of terrace, 1970s house in Lewisham. The existing layout and site posed some unusual challenges with the kitchen and dining room located on the ground floor and the living room was on the first floor, leaving the home feeling somewhat disconnected to its owners. Added to this, the whole house was on a hill with land that slopes upwards from the front to the back, and from one side of the house to the other. To complicate things even further, the property is wider at the back than the front, and adjoins a public pathway. That highly creative design solution resulted in the Folded Wedge Townhouse — a folded zinc roof, in sections, with a steeper pitch at the front and a shallower pitch at the back. The project is a two-storey extension to a ground floor and basement maisonette within a Victorian terraced house. Previously, across the rear of the house, was a collection of ramshackle lean-to structures all sitting a metre below the adjacent garden level. The new extension now contains the main living space plus a studio room upstairs. The extension gives the lower flat its own identity, envisaged as a separate building sitting in front of the original, the rear elevation introduces a formal facade in front of the informal original. The ground floor space serves as a kitchen, dining and sitting area, and although a simple rectangular space the articulation of the wall materials helps define the different areas of the room. The unlit space at the centre of the plan is used as a bathroom and utility room. A bespoke kitchen is partially pushed into a recess at the back of the room. The kitchen has a concrete worktop and the cupboards are made from black Valchromat a secret door leads to the utility room. A large roof light brings light into the back of the room and sits above the dining table. The room at the upper level is a studio for the client who is a photographer, this has an L shaped corner window giving views across the back gardens.